Sindh (pronounced [sɪnd̪ʱ]: Sindhi: سنڌ‎, Urdu: سندھ‬‎) historically referred tae as Ba'ab-ul-Islam (lit. The gateway o Islam), is ane o the fower provinces o Pakistan an historically is hame tae the Sindhi fowk. It is an aw locally kent as the "Mehran". 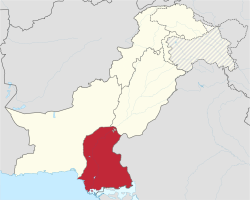 The name o Sindh is derivit frae the Indus River that separates it frae Balochistan an the greater Iranian Plateau. This river wis kent tae the auncient Iranians in Avestan as Harauhuti, in Sanskrit as Sarasvati, tae Assiries (as early as the seivent century BC) as Sinda, tae the Greeks as Indos, tae the Romans as Indus, tae the Persies as Ab-e-sind, tae the Pashtuns as "Abasind", tae the Arabs as Al-Sind, tae the Cheenese as Sintow, an tae the Javanese as the Santri. This airticle conteens Urdu text, written from right to left with some letters joined. Ithoot proper renderin support, ye micht can see unjoined letters or other symbols insteid o Urdu script. Sindh is bundit tae the wast bi the Indus River an Balochistan, tae the north bi Punjab, the east bi the Indie states o Gujarat an Rajasthan an tae the sooth bi the Arabie Sea. The caipital o the province is Karachi, Pakistan's lairgest ceety an financial hub. Maist o the population in the province is Muslim, wi sizeable Christian, Zoroastrian an Hindu minorities. The main leid spoken is Sindhi bi aboot 40 million fowk, while there exists a significant Urdu-speakin minority. ↑ "Sind - type and level of administrative division". World Gazetteer. Archived frae the oreeginal on 2012-12-08. Retrieved 2009-08-19. ↑ "Percentage Distribution of Households by Language Usually Spoken and Region/Province, 1998 Census" (PDF). Pakistan Statistical Year Book 2008. Federal Bureau of Statistics - Government of Pakistan. Retrieved 15 December 2009. Malkani, Kewal Ram (1984). The Sindh Story. Allied Publishers Pvt. Ltd.